today I officially gave notice to the landlord of my workshop to break my lease. Leases are funny things - mine was/is a 5 year lease with a break clause at the end of year 3, but to use the break clause you have to give 6 months notice - if you give it one day late, or haven't paid your rent on time or any other thing you could do wrong then you can't end it at the break clause and you have to stay the full term .... but as you know we have run out of room and we have made the decision that we cannot stay here for another 2.5 years (as an aside, I can't really believe I have been in this workshop for 2 and a half years already!!) ... we started looking for bigger premises late last year, but as you know, the one we found didn't work out but we have been looking and visiting and having talks and *think* we have a new one in the pipeline. I'm not showing you photos or telling you anything about it until I know for sure, and that can take weeks because it just does take weeks to do anything involving solicitors and estate agents....so I am in workshop Limbo - I have officially said goodbye to the current one and don't have a new one lined up - and that it is slightly terrifying!!! but I'm not worrying about it - my only sleepless nights are caused by making sure I wake up early enough to do all my sewing! I just finished everything in the nick of time to get them in the sacks with today's post! 8 days from order to delivery - not a bad turnround on 150 embellishments! and we shant mention that they didn't actually order flowers. they only actually ordered frogs, mushrooms, diggers and cupcakes. Don't know why I made flowers. But I noticed before sending them out so have 30 for next time. But we won't mention that. OK? ...I pile up all the things I have made over the weekend and surprise myself with how much I managed to sew !! The Polka Dot stack fits perfectly...I'm just not sure how I'll get the green squares from the bottom... but hey, at least the cutting table is free!! there's just something particularly lovely about great big piles of felt isn't there? and before you all think I must be working 24 hours a day, let me tell you I'm not (just the normal 14-16 hours a day) - all this hard work is John's - he's good isn't he? It's time to get your Autumn Craft ON !! and so has the spare stool! printed felt in the shop NOW! 12" x 12" squares :: 100% acrylic :: each print comes in 20 different colours :: just £1.10 a square:: and all of them are on the website NOW! ordered in April :: paid for in May :: refunded in May :: order deleted :: order lost :: no one has a clue if I will get my forward order or not in June :: I give up and think order will never be delivered in August :: order delivered in September :: not the easiest way to get good stock - but get it I did, now feast your eyes upon the most gorgeous and most bargainsome ribbons for Christmas EVER!! you can by them in a Mix Pack - 1m of all 25 designs for just *wait for it* ....£8.25!! I know!! OR if you are a sewer who needs tonnes of ribbons you can buy a whole roll for £7.25 - 25m for £7.25! I told you it was bargainsome! and knowing how hard it was to get the order in the first place, I'm not promising I can get anymore!! I love a delivery of Fiskar Scissors - look at all that Orange loveliness - snip snip snip - chop chop chop, you can't beat a pair of Fiskars! Needles & pins have been re-stocked too, as have all my lovely sewing thread colours! woah I made this freebie a bit complicated didn't I ? 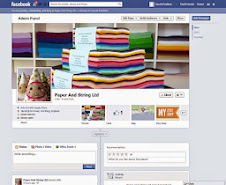 Sew Kidding shared Paper And String Ltd's photo. They're all so cute! My son would love to win the lion and the fox. hello!! I like the bunny and the lion very much, are cute!! Pin spin teal, soul garden pink and doodlebug flowers. All lovely! I would love the doodlebugs heart multi, Ta dot teal and Ta dot stone. Thanks for the chance to win. I would love the bees, owls and snails. The Felt and Fabric Holly Garland Kit is my favourite. Thank you for your generosity! The Felt and Fabric Holly Garland please! well done to all the lucky people and a great big thank you to everyone who joined in - I love freebie day!! !